Casual fun pre bat mitzvah photo session. This photo session was set up on location inside the clients home in Melville, Long Island. My studio photography equipment is fully portable and I can shoot anywhere. 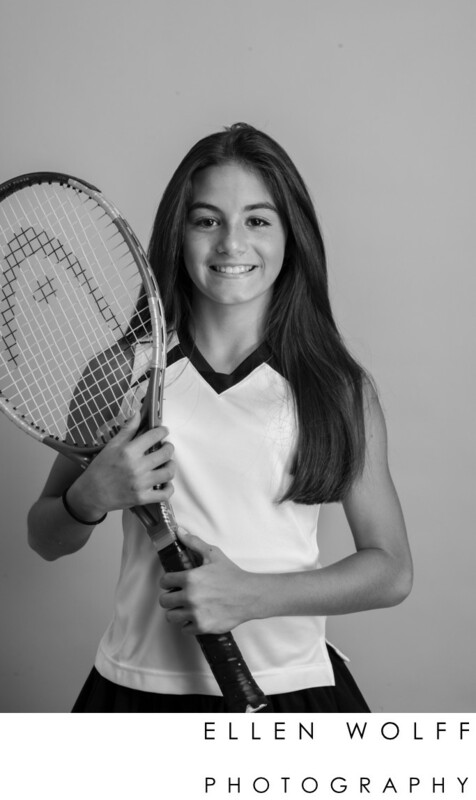 The bat mitzvah girl and her mom wanted various portraits of her depicting all of the different facets of her life: as a camper, a tennis player, a skier, girl who loves fashion. She even poses with the beloved family dog! In the end some of these portraits were converted to black and white and printed very large. They were hung around the room, used as decor. One was selected as a signing board for all of her friends, family and guests, to write their good wishes and sign their names.